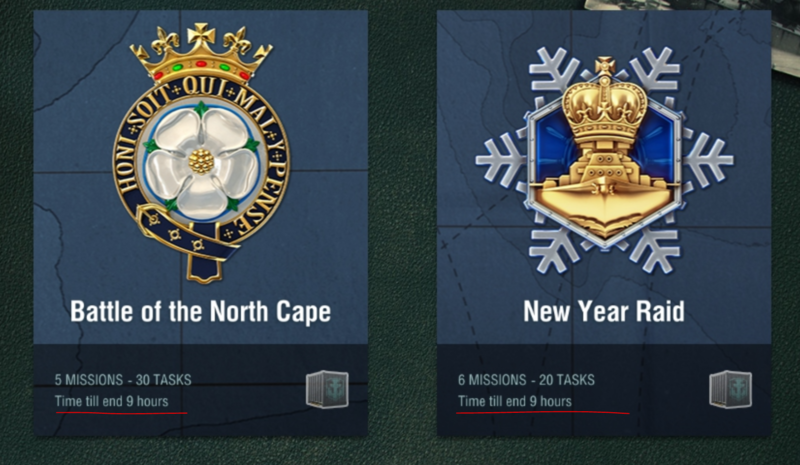 Battle of North Cape Campaign end date? What gives? I'd been planning on having until the 19th to finish these but now they're ending in a few hours? Seriously? It's still the 19th. In-game timer can only be changed via a patch IIRC. I pushed to finish the New Year Raid last night anyway, just to be sure. If it's anything like the last few campaigns, plan for it to end early when the patch hits. If I remember correctly last grind/challenge for the Bismark + cammo ended 12 hours early due to the patch. I have finished the DoY campaign and most of the NY Raid, only have the last mission left (get 1000 base xp). I had such a great day grinding the last few missions in PvE, did not need more than one mission each for them after grinding all the credits. The 1000 base is almost impossible in Co-op so I know I have to have an average game with a win in PvP to complete it so wanted to end the day on a high note and wait until tomorrow to slog away in Random battles where I will have zero fun... With luck it won't take more than 4 games to get what I need to get the last reward. Hopefully when I sign in tomorrow the campaign is extended. Patch just hit and the campaigns now say 2 days remaining, you were right, the in-game timer just hadn't been updated.